I love 💁 but it turns out I use it less than 😂 on Twitter. Emoji Life, a fun analytics tool for Twitter, tracks which emoji you tweet and gives you tons of detail about them. Log in with your Twitter account and you’ll get an overview of your emoji usage — apparently I use emoji just 7.2 percent of the time when I’m tweeting, which is less than I thought. It then breaks down other statistics, like which emoji people like most on your account (😍 ) and which makes people retweet more (😂), as well as other information like tweets with emoji over time. 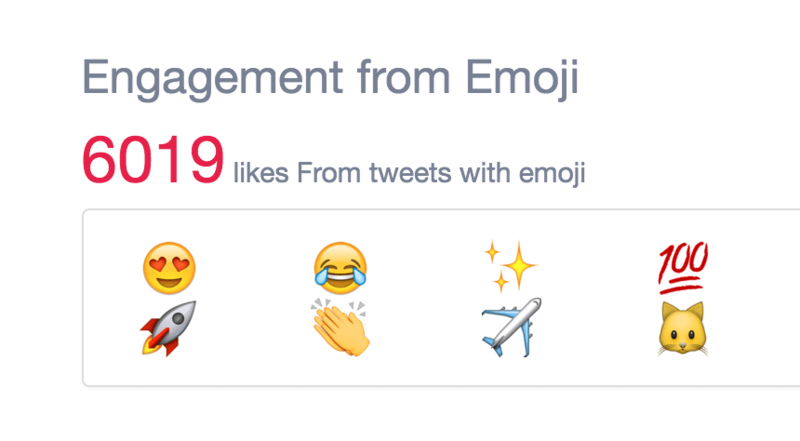 Emoji Life is like Twitter’s official analytics tool, but way less boring. I always wanted to know how many times I’d used 🍆 and now I know: 8. It’s completely pointless, but I love it.